Cookies are amazing. Chewy, soft, crunchy, chocolatey, sweet, buttery, there are all SORTS and kinds of cookies! What’s REALLY awesome, is when the cookies taste good, AND they are good for you. Which leads me too..
Mi-Del Cookies! This company makes a bunch of products, including the 3 that they generously sent me that I am going to review today. The lucky three today are the Bite Sized Oatmeal Chocolate Chip Cookies, the Gluten Free S’Mores cookies, and the Maple Munchies cookies. Let’s begin! Gluten Free S’mores- The package states these are “Chocolate Graham Cookies with Marshmallows”, and these come in 90 calories packs. I was actually impressed, because I got a decent amount of these cookies for 90 calories! Each cookie is a dark brown in color, with little white specks. They are about the size of a half- dollar, and actually quite thick. How’s the taste? …. AWESOME! I really enjoyed these. They were crunchy and crispy, and a sweet chocolate cookie. The little marshmallow bits tasted like little bits of vanilla icing. Really tasty, and I really enjoyed the CRUNCH these provided. The only down side in my opinion was that they lacked fiber, and contained corn syrup solids. Otherwise, 4 1/2 stars! Bite-Sized Oatmeal Chocolate Chip- 23 cookies (30 grams) is 130 calories, 6 grams of fat, 18 carbohydrates, 1 gram of fiber, 7 grams of sugar and 2 grams of protein. Gluten Free S’mores- 1 pack (23 grams) is 90 calories, 2.5 grams of fat, 17 carbohydrates, 0 grams of fiber, 7 grams of sugar and 1 gram of protein. Maple Munchies- 1 pack (23 grams) is 100 calories, 3.5 grams of fat, 14 grams of carbohydrates, 1 gram of fiber, 4 grams of sugar and 2 grams of protein. For more information about Mi-Del cookies, you can click here. Barbara’s Bakery Beanie Puffin Giveaway! * ends FRIDAY! There’s nothing quite like a cookie. Some have cute designs, some are sweet, some are rich, some soft, chewy, etc. I think it’s hard not to have a favorite cookie! What is hard, however, is finding cookies that are both tasty but don’t have things like preservatives, trans fats, artificial colors, flavors, etc. 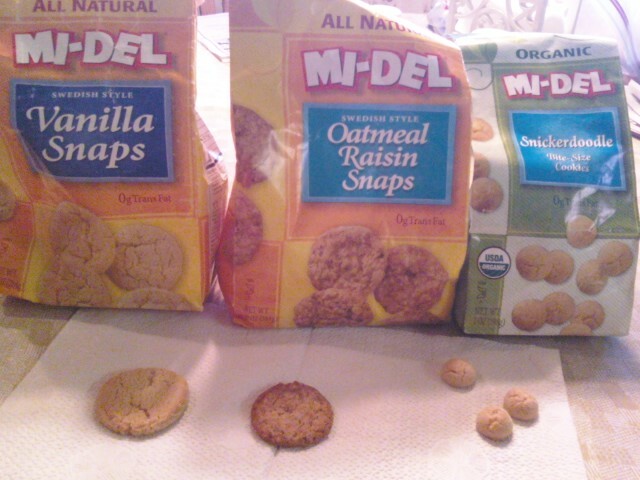 However, Midel Cookies make a large assortment of cookies that are all natural and still taste good. They make gluten free, organic, bite sized and more types of products, to fit the needs of a variety of people. 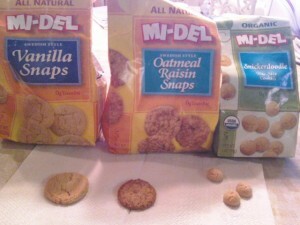 Midel Cookies were nice enough to send me a box of some of their goodies, and I decided to review about the Vanilla Snaps, Oatmeal Raisin Snaps, and the Organic Bite Sized Snickerdoodles. Vanilla Snaps- these were quite delicious. They had a nice vanilla and buttery flavor, and I tried these with my cousin who agreed they tasted very similar to a sugar cookie. And,well,- these CERTAINLY live up to the “snap” part of the name! They are very crispy and crunchy, and overall a very hard cookie. However, they do have sort of an “off” texture with the crunch- as they are also a bit “sticky”. I mean “sticky” as in once you chew them, they kind of stay in your teeth and are a bit chewy. That’s the only drawback to this cookie- for taste, alone, I would definitely give it 4 1/2 stars, but the texture bring these down to a 3 1/2. Organic Bite Sized Snickerdoodles- these are TOO CUTE! They are literally the size of buttons, and just perfect to eat one by one, or by the handful. When you open the bag, oddly enough, they smell like cinnamon graham crackers. But, they taste like sweet shortbread cookies, with a slight vanilla flavor. Very soft and almost a “bready”/crumbly texture. Or, almost like a biscuit-like cookie. Warning- these are totally addictive! Especially because they are small, you really could just keep eating these by the handful! These get 4 stars because they are a bit high in saturated fat, and have no fiber, but are still good! Oatmeal Raisin Snaps- 5 cookies is 130 calories, 4.5 grams of fat, 21 carbohydrates, 1 gram of fiber, 10 grams of sugar, and 2 grams of protein. Organic Unbleached Wheat Flour, Organic Dehydrated Cane Juice, Canola Oil, Organic Oatmeal, Raisin Paste, Organic Liquid Cane Syrup, Ground Cinnamon, Natural Vanilla Flavor, Natural Oatmeal Flavor, Sea Salt, Soy Lecithin (used as an emulsifier), Baking Soda. Vanilla Snaps- 5 cookies is 130 calories, 4.5 grams of fat, 21 carbohydrates, 1 gram of fiber, 10 grams of sugar, and 1 gram of protein. Organic Unbleached Wheat Flour, Organic Dehydrated Cane Juice, Canola Oil, Organic Liquid Cane Syrup, Natural Vanilla Flavor, Baking Soda, Sea Salt, Soy Lecithin (used as an emulsifier). Organic Bite Sized Snickerdoodles- 23 cookies is 130 calories, 5 grams of fat, 19 carbohydrates, 0 gram of fiber, 7 grams of sugar, and 1 gram of protein. Organic Enriched Wheat Flour (niacin, iron [reduced] thiamin mononitrate, riboflavin, folic acid), Organic Dehydrated Cane Juice, Organic Palm Oil, Organic Rice Flour, Organic Cane Juice Syrup, Sea Salt, Organic Vanilla Extract, Organic Ground Cinnamon, Ammonium Bicarbonate, Soy Lecithin (used as an emulsifier). 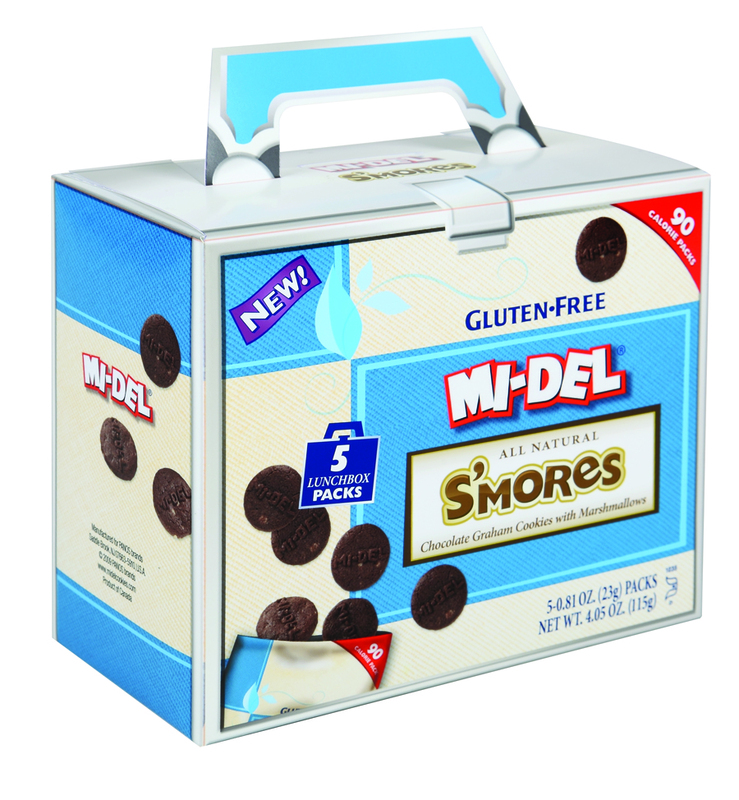 Midel makes a whole bunch of products, and they have a gluten free line. Midel makes the cookies and snacks without preservatives, trans fats, or artificial ingredients. Some of them are even dairy free! I got to try the Arrowroot, Chocolate Chip, Chocolate Caramel, and Chocolate Sandwich varieties sent to me by the company. Arrowroot-uhhh, Deliiishh! Nice and buttery flavor! These were sweet and crispy animal shaped crackers. Too cute! I particularly liked the polar bear and the camel. Almost too cute to eat 😉 These have a light vanilla flavor as well, and i think they taste better than the original animal crackers. They aren’t as dry or bland in my opinion, and have more of a buttery/vanilla flavor. 4 stars! Chocolate Chip-These were good! The cookie is crispy and has a buttery taste to it. They have a golden brown color and have a good amount of chocolate chunks in them. They have the right amount of sweetness- not overpowering at all. A good Chocolate Chip cookie replacement! (plus- you get 5 in a serving! whoop!) 4 stars! So, viola! Cookies for those of you who are sensitive to gluten that taste good! Hey, Midel’s cookies are good for those who can have gluten as well 😉 Overall, i’m giving them 4 stars. All natural, yummy treats everyone can enjoy.The only downside is that they are short of fiber. Arrowroot- 10 cookies are 130 calories, 4 grams of fat, 23 carbohydrates, 2 grams of fiber, and 2 grams of protein. Chocolate Chip- 5 cookies are 130 calories, 4.5 grams of fat, 21 carbohydrates, 1 gram of fiber, and 2 grams of protein. Chocolate Sandwich- 2 cookies are 140 calories, 6 grams of fat, 21 carbohydrates, 1 gram of fiber, and 1 gram of protein. Chocolate Caramel- 23 cookies are 110 calories, 3.5 grams of fat, 21 carbohydrates, 1 gram of fiber, and 1 gram of protein. Arrowroot Gluten-Free Flour (Corn Flour, Soy Flour, Potato Flour, Corn Starch, Rice Flour, Potato Starch, Xanthan Gum), Organic Dehydrated Cane Juice, Canola Oil, Arrowroot Flour, Butter, Whole Eggs, Corn Starch, Honey, Natural Flavors, Soy Lecithin (Used as Emulsifier), Baking Soda, Sea Salt. Chocolate Chip- Gluten free flour (contains corn flour, soy flour, potato flour, corn starch, rice starch, potato starch, rice flour, white bean flour, xanthan gum), dehydrated cane juice, organic chocolate chips (organic sugar, organic chocolate liquor, organic cocoa butter, organic soy lecithin, organic vanilla, organic corn syrup solids), non hydrogenated canola oil, butter (may contain color additive annato), egg whites, unsulphered molasses, corn starch, baking soda, natural flavors, sea salt, soybean lecithin (used as an emulsifier). Chocolate Caramel- Gluten Free Flour (tapioca starch, potato starch, corn starch, corn flour, rice flour, carrageenan, acacia gum), organic dehydrated cane juice, canola oil, invert sugar, cocoa powder, caramel pieces (sugar, coconut oil, corn syrup, salt, natural flavor, caramel color, annatto color, soy lecithin), natural flavor, sea salt, ammonium bicarbonate, soy lecithin. Chocolate Sandwich-Gluten Free Flour (tapioca starch, potato starch, corn starch, corn flour, rice flour, carrageenan, acacia gum, xanthan gum), organic icing sugar, cocoa, organic palm oil, canola oil, invert sugar, natural flavor, egg, baking soda, sea salt, soy lecithin, ammonium bicarbonate. icing- organic icing sugar, organic palm oil, canola oil, natural flavor, soy lecithin. Hey dont forget about my GIVEAWAY for Sahale Snacks! It ends Thursday Night at 11:59 PM!